It is exactly no secret that this is my favourite of the Harry Potter books. I love a good rebellion. I love the sensation of fighting against incredible odds, of using subversion, of righteous indignation bubbling over into furious action. And so my favourite part of this book is towards the end, when the students launch a full-scale insurrection against Dolores Umbridge. (Umbridge, by the way, is one of the most successful villains of all time. She’s hateable in a way that’s so much more real than Voldemort, at least prior to Deathly Hallows — I remember just wanting to reach into the book and throttle her fat little neck). The scene where Fred and George take their leave of Hogwarts is one of my favourite moments in the entire series, and I laugh my way through the entire section where J K describes how the students (and other professors) are undermining Umbridge’s reign. From Lee Jordan levitating Nifflers into the office, to the vast outbreaks of illness thanks to the Skiving Snackboxes, to the firework resolutely spelling “POO”, to McGonagall telling Peeves that the chandelier unscrews the other way, I just love every little bit of it. And J K builds to this point magnificently — so much of the book up till that point is so frustrating. As a reader, you feel Harry’s sense of being boxed in, headed off at every turn, every opportunity for relief nipped in the bud — and so the emotional release, the sense of triumph, is augmented, greater for its contrast to the stifling atmosphere that came before. But I also love the overall idea of the Order, and it’s mirror in the DA. Even as Sirius reminds us that the world isn’t split into good people and Death Eaters, we do see the lines of battle emerge. And I love the glimpses we get into the First War. Anyone who’s read the fanfiction I wrote during the height of my involvement in HP fandom knows that my fascination lies in those years — I wish we knew more about them, and I love to explore them myself. So I love the information we get about it in OotP, from the family entanglements, all the information on the House of Black, to the composition of the Order the first time around, as we see them in that picture of Mad-Eye’s. It also makes me wonder where the Ministry stood during the First War — How involved were they? Did the Order have to be as much of a secret? After all, we know that Mad-Eye and the Longbottoms were Aurors and in the Order, which wouldn’t necessarily mean as much, considering Kingsley and Tonks playing double-duty the second time around, except that we’re also explicitly told that the Aurors were responsible for bringing in many of the dark wizards associated with Voldemort. So I wonder if the Order was quite as taboo as it had to be, thanks to Fudge’s thickness, the second time around. And then I love what J K does with the DA, not least because it brings out the potential in so many characters. Neville Longbottom starts to show the flicker of badassery that we see from him in Deathly Hallows. Some of the students who might otherwise be dismissed as frivolous, like Lavender, Parvati, etc, show real aptitude and concentration, devoting their energy to these practices. It’s a great display of inter-House unity, excepting the total absence of any Slytherins — but at least it brings in the Ravenclaws and Hufflepuffs, showing that Gryffindor House does not have a monopoly on fighting the good fight (or on talent, for that matter). The greatest transformation, though, is that of Harry into a leader and a teacher. He starts to find out just what he can do, how he can inspire, encourage, and correct. I love when he gets a set of practical defensive magic books for Christmas from Sirius and Lupin and, rather than seeing them as more homework, gets excited to look through them and find ideas for new lessons. I know that J K tells us that Harry goes on to become an Auror and all of that, but I sort of hope, once he’s starting to be a bit long in the tooth for that profession (not to mention that I don’t know what Aurors do when there isn’t a wizarding war on), that he comes back to Hogwarts to teach Defence Against the Dark Arts. (I also hope that he went and played Quidditch professionally for a while before becoming an Auror, because, c’mon, the guy has earned a break — but that’s a different theory entirely). So, I love this book. But this is also the book that broke my heart. The first time I read it, I sobbed for ages over Sirius’s death. Ran wailing to my mother in the next room, actually, and then sniffled my way through the remainder of the book. Because it’s just so unfair. After all he went through, and after a year of frustration, of all his energy and vitality chained up, given no outlet… and then he just dies. For so long I was one of those who refused to believe it. I knew, after all, that every hero’s journey includes a visit to the Underworld, and I was certain we’d be seeing Sirius again. As it turned out, I was right about that, though not quite in the way I’d hoped. I don’t think it was until after I finished Half-Blood Prince that I accepted that nothing was going to bring him back. I blame Harry, Dumbledore, and Snape in equal parts for Sirius’s death. I blame Sirius for it a bit, too, because of how he treated Kreacher, which was definitely wrong — but given the tragedy of his life, the thirteen years of Azkaban leaving him emotionally arrested in so many ways, I don’t know that he psychologically could have treated Kreacher any other way. (I admit a bias, of course, with how positive I am on Sirius). The other three, though — okay, maybe I’m being a bit unfair to Harry, who is only fifteen himself (and I generally cut him a lot more slack in this book than many readers have — I think CAPSLOCK!HARRY is completely understandable to anyone who remembers being fifteen) — but his refusal to even look at the communicating mirror bewilders me. That would have saved so much trouble right there. Dumbledore should’ve known better in how he treated both Harry and Sirius. I still can’t bring myself to believe there was nothing Sirius could have done to help the Order, that there was no way to get him out of that house (or that there was no one who couldn’t have moved in with him, so at least he wasn’t brooding and alone there). Knowing both of those personalities, Dumbledore should have known that ignorance and inaction were not the way to achieve the desired ends. And Snape has no excuse for his complete failure to teach Harry Occlumency. I know Harry was being recalcitrant, but Snape, you’re a professor, this is not new to you, and he really doesn’t do a damn thing to help Harry learn. Telling the kid to empty his mind clearly was not an effective strategy and man do I empathize with that — it’s the reason I’m crap at any kind of meditation and can’t do yoga. It doesn’t come along that easily for some people, especially those whose passions run high and hot. Snape didn’t teach. He just expected Harry to figure it out himself, which was totally unhelpful. It also might’ve helped if either Dumbledore or Snape had warned Harry that Voldemort might’ve been trying to plant false images; then Harry wouldn’t have assumed that his vision of Sirius was as true as his vision of Arthur had been. He could’ve been on his guard, even if he was seeing things. And all of that is what breaks my heart about Sirius’s death more than anything — it was so needless, so wasteful, so avoidable. Which is a harsh truth about life, really, but of anyone that J K could’ve killed off, especially so early, she picked exactly the one person I would have begged her to save. I expect she knew what an impact it would have on her readers — that, like Harry, we’d come to see Sirius as a font of hope, as someone who would treat Harry more like an adult, give him the information others held back, protect him like a father, and maybe, someday, give Harry the home and family he’s yearned for his whole life. She builds up Sirius’s potential so much, reminds us how handsome and vital he was in his youth just to underscore the damage the years have done to him, shows us how he’s been fettered, how much he strives against being chained in, how much his passionate nature needs freedom, and she makes us hope that there will be a better life out there for him in the future — and then she cuts it off. It’s brutal. There’s also some brilliant, though really sad, foreshadowing in this book. It anticipates Deathly Hallows in a lot of subtle ways that I might not have picked up on so strongly if I hadn’t been listening to the DH audiobook. Take, for instance, Mad-Eye Moody’s paranoia over getting Harry out of Privet Drive, which most of the other members of the Advance Guard sort of roll their eyes at and treat as a joke. Well, just because you’re paranoid doesn’t mean they’re not out to get you. By the time we get to the Seven Harrys in DH, no one question’s Mad-Eye’s plans. It’s also interesting to mirror Fred and George’s decision to leave Hogwarts with Harry, Ron, and Hermione’s imperative to skip their seventh year. (It’s sort of an interesting message for J K to send — that education is important, but can only take you so far, and that the institutionalized program of education isn’t necessarily for everyone). Or take the flip-flops in the Ministry (a commentary on the general instability of politics if ever there was one). The MoM goes from adoring Harry in PoA to despising and ridiculing him in OotP, then to protecting him in DH, down to Rufus Scrimgeour’s ultimate sacrifice, all the way to working as a branch of Voldemort’s operation, declaring war on Muggleborns and hunting Harry down as Undesirable #1. There’s so much that goes into the transition of the war from underground to explicit. The characters also have to deal with the absence of Dumbledore in both books, though in very different ways: in OotP,it’s first his emotional absence from Harry’s life, his detachment and lack of engagement; in DH, it’s his death, the true, permanent loss. I wonder if all of these parallels between the two books were intentional, if J K thought them out and structured them into the greater shape of the series, or if they just sort of blossomed along organically with the story. I think this may be the longest review I’ve yet written on this blog, which speaks to how much this book means to me and how much of my brainpower and creative energy I’ve devoted to it over the years. 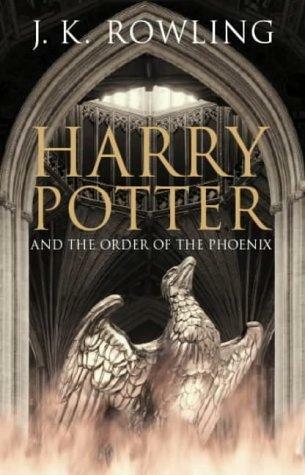 I suspect it’s no coincidence that OotP is the book where I got really deeply not just into the series, but into the fandom — and so this book, and so many of the details revealed in it, have a powerful emotional attachment for me. There are so many memories pressed within the pages, and each time I re-read, I get to revisit the discussions and arguments I had with friends, the RP threads exploring ideas, the effort and planning that went into my fanfics, and the glorious sense of accomplishment when I wrote something that I thought really nailed it — all the wonder of building a little place for myself inside this magnificent universe. Thanks for that, J K. It’s been priceless.